Growing under the magic of Said Akel and his likes , sensing the revival of cultures around me in Lebanon , where Greek , Turkish , Cherkess , Armenian , Kurdish , Syriac even Gypsy tongues are heard , people although good and loyal never sold their traditions for a Lebanese identity , they became that good extra making Lebanon so special , as Lebanese old Phoenicians we never tried to impose our ways and our tongue on anyone , and they did it , they murdered our language and stripped away the essence of our culture to replace it with Arabic, not only as a language but as forced ways of life , we were indeed violated once before by both the Roman and Byzantine cultures , the laws of the powerful remaining always the good laws , but within the heart of our villages, within the souls of our generations remained an untouched but yet to be born new Phoenicia , the Phoenicia I am day by day implementing into the minds and hearts of mine ..
That is to me a holy obligation I have been teaching my children and saying to all whom I knew that we have been violated and rubbed out of our identity culture and language , but as the Jews revived their language , the Asyrians kept their tongue alive, some few Arameans are guardians of the holy heritage despite all efforts to wipe their culture out ; so will we the Old Phoenician Culture the fathers of all the ancient cultures of the Greek isles, the Italian Isles , Malta and the fathers of the Carthaginian Punic heritage , and yet to remind us all of the good old days of the kingdoms of jubail and Sidon and sour , to revive the pride of Hiram the Souri this genius who paid his life for his brilliant ways at the court of King Salomon , our Porphyre , our Hermon , the trade with Europe Scandinavia and even America some think , all this to tell this generation , that a good deal of what happened in Irak was because of the Kurdish longing for their own place with the freedom to exercise their own culture in their own language , the over 60 years long dilemma of Palestine was because the Jewish nation hung for 2000 years to Its Heritage and Culture and its historical land , the Armenian struggle for Armenia free , although they never recovered old Armenia as we will never recover old Phoenicia extending from Akko into Tartous and Banyas , still we have to recover the existing Lebanon as the struggling today are neither fighting for a Lebanese Lebanon nor a Phoenician lebanon , they are killing us all and each other for an alien Lebanon , its towns becoming appendices to this or that entity , therefor we have now a golden time to petition together with all good true Lebanese in Lebanon and abroad to sign a demand addressed to the UN to grant us the right to declare Lebanon an Internationalized Neutral zone as many in this world unconcerned by regional racial political or confessional matters , respected in its longing for its identity by all nations , to be assisted economically and militarily in achieving this neutral total independence , when millions will agree to sign such a petition the world has to listen to accept our wish and to grant it through an international enforcement of this general will , as we can and will maintain a mutually good and peaceful relations to all , our origins mixed , our confessions , becoming our characterization , as in Belgium, Switzerland , or even as in Monaco and Andorra having the guarantee of the two more powerful states to both maintain this status quo through their laws , or as the Luxembourg independent but yet defended by both states or by the UN , or as San Marino independent but with all its external and defense affairs guaranteed .. 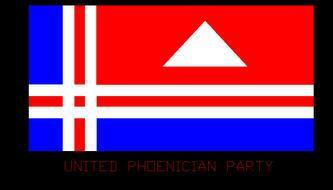 The United Phoenician Party is a non-religious or sectarian organization, the UPP will continue to fight Terrorism,criminals and political corruption. Once a nation’s history becomes defined by the challenge of “We have been here forever, but where do we go from here?”, the only means left for that nation’s people to survive and rescue their existence is to take the fight and expose the roots of their culture to the whole world. The roots of a culture are the inner law that governs the instinct of survival of that nation. These three references are from the Bible and recount the journey of St. Paul and other persecuted among Christ’s followers in early Christianity. They enlighten us to the fact that the disciples were looking for a sanctuary in Phoenicia from which they would spread the message of Christ throughout the ancient world. We are not bringing this study to light for a religious purpose, but instead to use the Bible as a historic document that reaffirms the preexistence of Phoenicia before Judaism, Christianity and Islam. A culture can investigate religious texts to build the case for the originality of its ancient roots. And the accuracy of the text will confirm the invalidity of any claim that disputes the matter of that existence. We can dig beneath the surface and reveal the ancient structure of a temple or a city. We can rebuild over the original foundation a totally new structure. However, if we use the ancient text for a religious purpose only, it is like elevating a new ceiling over an old structure without the four standing walls. The four walls are the elements that give its virtual shape to the new structure are: One, the remodeled old structure has to relate to its present milieu. Two, the new structure should recognize the history of its neighbors. Three, the new structure has to be recognized by its historic neighbors. And four, they must renew their historic peaceful bond with each other. These four elements will give back to the whole neighborhood its historic and essential nature, and without them the old foundation and the new ceiling would lay flat on top of each other. Nations become greater once their entire population shares their belief in the history that belongs to the legacy of their motherland. Also, a great nation would drive itself to ruin once its population lives at odds with the history of the motherland. The Middle East today is in the midst of an agony that is threatening the peace around the world. It is the pain that will give birth to a new age in human history. Moreover, there is in Lebanon a demographic force that is working to alter the historic culture of the motherland with a phony identity that is being exported from beyond the region. This despicable and vile act is hostile to the peace and tranquility in Lebanon, the region and around the world. Hence, if the nations in the region and the world community desire everlasting peace and harmony in the Middle East and among each other, consequently it is time for the Lebanese people, like the other nations, to give a free voice to their desires and wishes as well. We, the Lebanese, should be given a chance to acknowledge the roots of our motherland Phoenicia. Likewise, the designers that conspire to redraw the map of the region at this time have to recognize the existence of Phoenicia. Phoenicia is the doorway that will bolster the historic reason for every other nation in the area to exist in peace and freedom. i dont understand the cause and the motive of edification relationship with the albaath syrian regime? ?..while we all knows his crimes against a lot of promenent lebanes leaders ?and the lebanes people need to know that life of the state of lebanon is of the death of albaath syria regime?...what they want to see just a dead LEBANON?. Dears all/ let us do it now so as saving our great homeland of all lebanes ...saving him of those filthy illminded...criminales and terrorists .